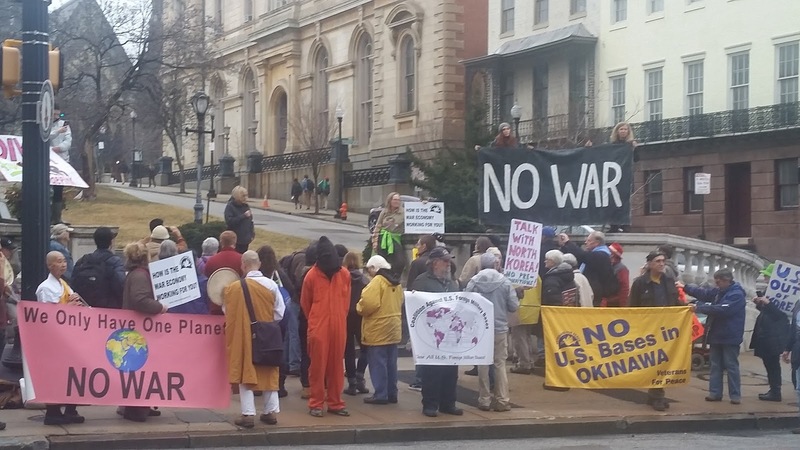 Yesterday we gathered from 3:00-5:00 pm at a busy intersection in downtown Baltimore for a protest event to kick-off the No Bases Conference being held this weekend at the University of Baltimore. The conference sold out about a week ago but an overflow room has been secured where folks can watch the proceedings at a cheaper rate. The entire conference will also be live streamed so you can watch from home by using this link. 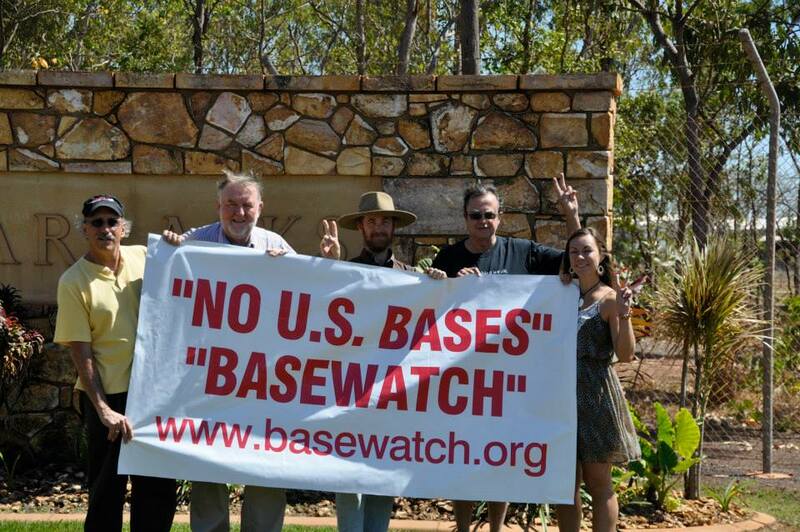 This will be an important event for the national and international peace movement. We've been needing to build greater unity for years between various groups across the US and around the world. We've also needed badly to connect the dots about US military intervention and occupation showing how the more than 800 Pentagon bases around the world are used as the global fist of corporate capitalism. Mr. Big wants to run the world - wants to control all the resources around the globe - and US bases are the primary instrument to implement that strategy. In my organizing I've long tried to highlight these deadly connections. I've worked to connect the dots between my home town (Bath, Maine) and the warships built there and how they impact places they are sent such as the new Navy base on Jeju Island, South Korea. When we do civil non-violent resistance at destroyer 'christenings' at Bath Iron Works (BIW) we are trying to get the local citizenry and the Navy crews to also begin to see these connections. In a related note we finished our Aegis 9 jury selection last Tuesday and go to trial on February 1-2 at the Sagadahoc County Courthouse (corner of High & Centre Street) in Bath at 9:00 am. The public is welcome to attend any part of the trial. Three of the nine arrested at BIW on April 1, 2017 are repeat offenders and the prosecutor is asking for jail time for us (Jason Rawn, Russell Wray and myself). The Pentagon is chewing up the national treasury of the US making it virtually impossible to have money for any social programs across the land. Until we deal with the voracious appetite of the military industrial complex I am afraid that our very severe domestic collapse will only accelerate. 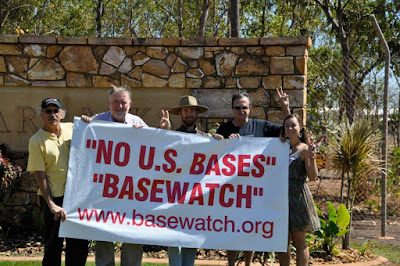 Thus closing overseas US bases and converting military production factories at home to sustainable production is a must. The General Dynamics $60 million corporate welfare bill now has been filed in Augusta as LD 1781. Sponsored by Rep. Jennifer DeChant (Bath) and Cosponsored by Sen. Vitelli of Sagadahoc and Representatives: Epling of New Gloucester, Fredette of Newport, Speaker Gideon of Freeport, Golden of Lewiston, Pierce of Dresden and Senators: Jackson of Aroostook, Mason of Androscoggin and President Thibodeau of Waldo. According to Taxation Committee staff the bill is not likely to appear before the committee for hearings before January 29. A reporter has requested FOAA for all email correspondence between both bill sponsors (Rep. DeChant and Sen. Vitelli) and General Dynamics. We should be hearing more on that within a week or so. Please keep spreading the word as best you can. Also on Sunday I was sending an article to many members of the Maine legislature and the one I sent to State Sen. Eloise Vitelli (D-Arrowsic) was blocked. Sen. Vitelli is the co-sponsor of the bill to give $60 million of corporate welfare to the General Dynamics Corporation that is being written by Rep. DeChant. 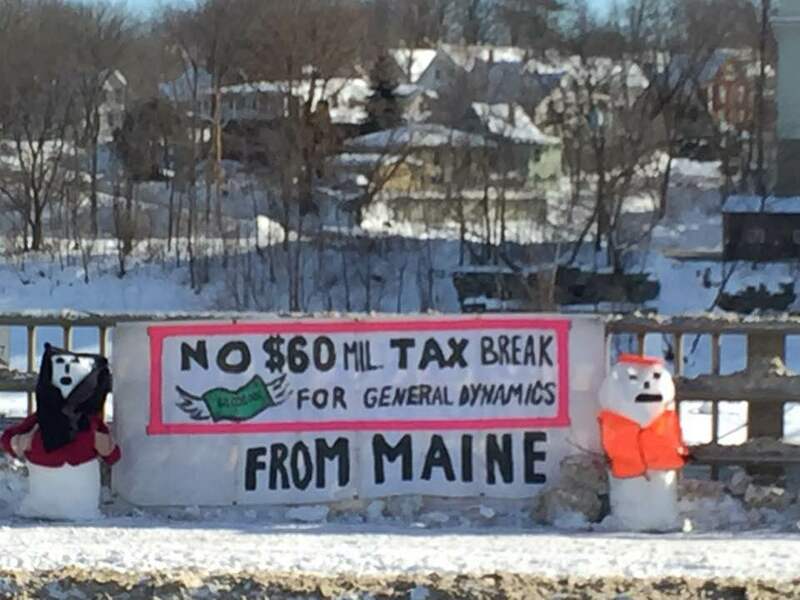 It seems unusual to me that two elected officials would be so concerned about hearing from people in Maine - after all when you run for office that is what you expect to happen. Especially when you are sponsoring a very controversial bill. Lisa included in her blog post this (above) copy of Sen. Vitelli's Tweet during the public outrage over the massive corporate tax cut recently passed in Washington by the Republican Congress. 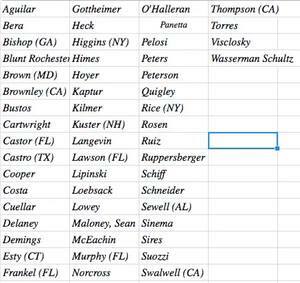 Our own Sen. Susan Collins (R-Maine) was a key vote to ensure passage. During that very public political battle Sen. Vitelli took a stand against the bill (which was a good thing to do). But now she has very quickly turned around and is co-sponsoring a smaller scale version of the same kind of bill - handing over $60 million to the 5th largest weapons maker on the planet - especially in our state where 43,000 children live in poverty. Anyone else notice the serious contradictions here? Very beautiful words by Matt Hoh in this short video. Matthew had nearly twelve years experience with America’s wars overseas with the US Marine Corps, Department of Defense and State Department. In 2009 he resigned a diplomatic post in protest of Afghan War policy including large U.S. troop deployments - the surge. He won the Ridenhour Truth-Telling Prize. We are still waiting for a bill number to be assigned to the corporate welfare bill in Augusta that would give $60 million to the well-endowed General Dynamics Corporation - the 5th largest weapons company on planet Earth. The sausage making process seems to be a bit slow - maybe the growing public push back has forced bill sponsors Rep. Jennifer DeChant (D-Bath) and Sen. Eloise Vitelli (D-Arrowsic) and General Dynamics lobbyists back to the drawing room table. 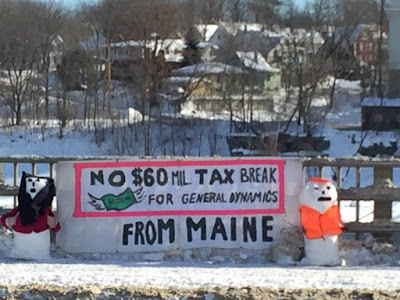 If you take the statements made by General Dynamics' brass over the years to their logical conclusion, they are essentially positing that Bath Iron Works is not a viable business without the assistance of Maine taxpayers, which is essentially a ludicrous claim, right? The 2016 recommendations are consistent with suggestions previously made by the consulting firm, which provides analysis biennially to the state. In a 2014 report, analysts suggested state officials eliminate the shipbuilding facility credit, and modify their economic development strategy to focus more on helping a wider range of businesses. “[P]rovide a series of programs that are available more broadly and which may be utilized by companies who are looking to start up, grow, or locate in Maine, regardless of industry or technology sector,” the report advised. So the bottom line is that the state has repeatedly been told to focus their economic development efforts on small business where tax subsidies would have more job growth impact. 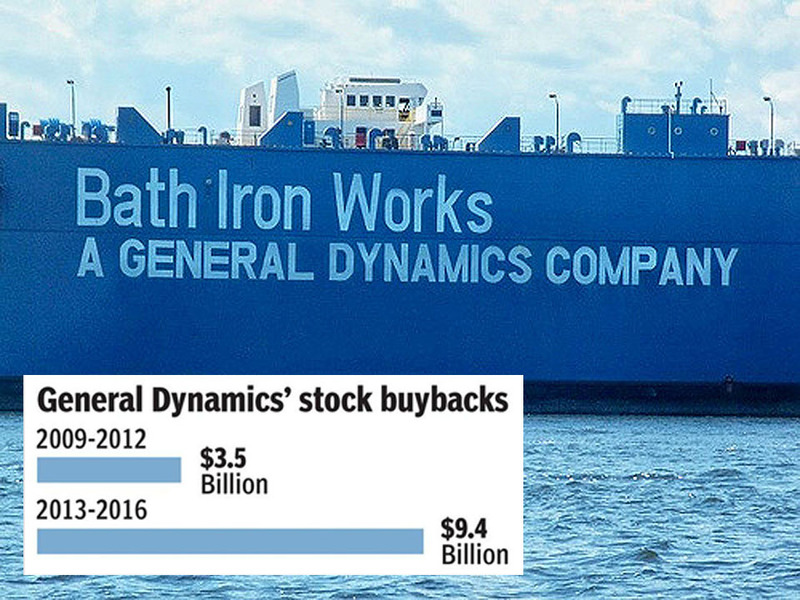 The facts reveal that even though General Dynamics (GD) has received $200 million in tax subsidies since 1997 from Maine they've reduced employment at Bath Iron Works (BIW) largely because they used the money for modernization and mechanization. Translation means the state has subsidized BIW/GD to cut their work force. People should be alarmed to hear that news. 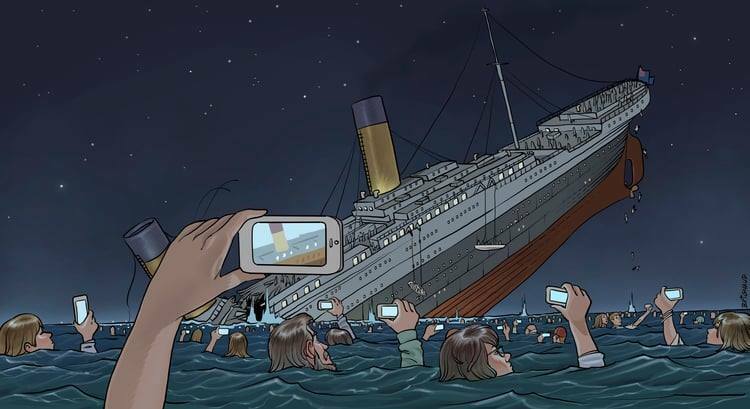 I don't want to live in that world - a chip in my arm or my brain? No thanks.